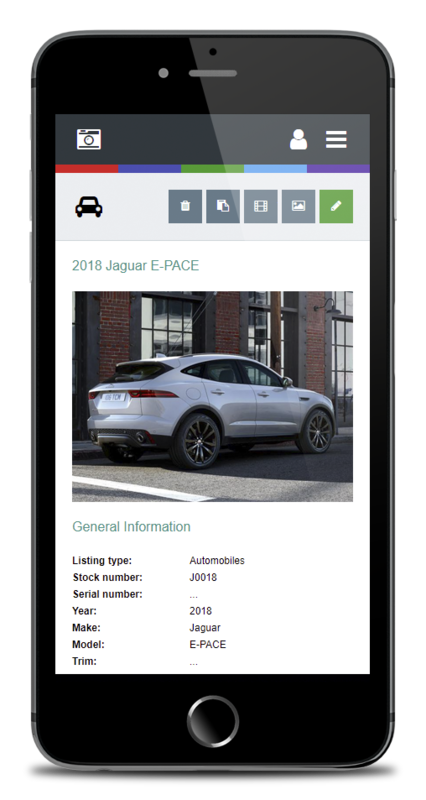 Grape, the responsize, mobile-friendly auto dealer content management system (CMS) for PHP by Rasbora Media, makes it incredibly easy to manage, display, and share your vehicle inventory on your website and social media outlets. Grape has been developed from the ground up using the latest mainstream web standards to provide the best user experience possible for your website visitors. Built with a mobile-first approach, Grape is fully responsive from end to end, giving your audience complete access to your inventory on any device. From keyword-rich page URLs to optimized code structures, Grape has been fine-tuned for fast page delivery and search indexing. Grape's true power lies in its focus. Grape isn't trying to be a one size-fits-all content manager for all of your website needs. It is a simple to use, powerful tool for presenting your vehicle inventory to the world. Built to run on an Apache - MySQL - PHP stack, Grape can be up and running in a matter of minutes. Grape is built on a solid foundation of standards compliant HTML5 and CSS3. 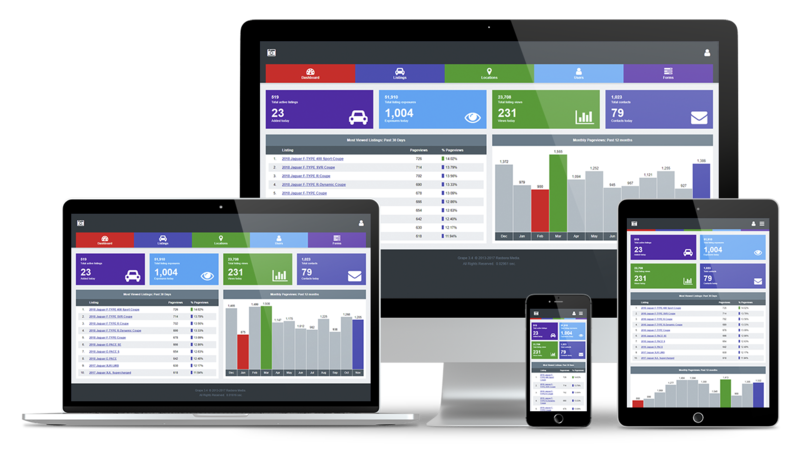 Manage the display of your inventory on any device from Grape's fully responsive admin panel. Your website visitors can view your entire online inventory from their handheld devices, tablets, and desktops, anytime, anywhere. Customizable form fields with multiple data display options allow you to list virtually any type of vehicle. Grape’s robust search, sort and filtering features make organizing your inventory listings quick and painless, saving you time and money. Detailed analytics track listing interactions, including exposures, and views. Localization options include currency selection and local time settings. Unlimited image uploads for each listing, automatic image resizing, and thumbnail creation to speed workflow. YouTube and Vimeo video integration. Grape features support for an unlimited number of user accounts with customizable access levels and detailed privilege settings. Support for multiple dealership locations allows even the largest dealerships to manage their online inventory from a single access point. Time to let Grape speak for itself. Click the buttons to launch the site and admin demos and see for yourself why Grape is the perfect solution for your online auto dealer inventory management and display needs. 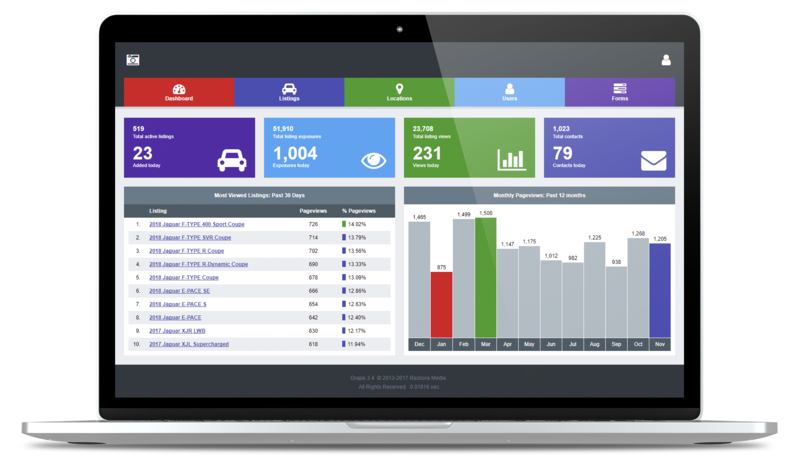 For the past several years Grape has been the go-to online auto dealer inventory management platform for a number of dealer and classified-style websites. Click the links below to see Grape in action. You've got enough to worry about, leave the setup to us. We offer free setup and support. As long as your server meets Grape's minimum system requirements we can have you up and running in a matter of minutes. Grape includes free technical support via email so no matter what the issue is, we're only a few keystrokes away. We offer a 30-day, no hassle, money back guarantee. We'll help you each and every step of the way to make sure you have a positive experience using Grape. But, if you choose not to continue using Grape you can request a full refund within 30 days of purchase. Please read our Refund Policy for more information. Grape has all of the tools you need, without all the clutter. Get things done faster and more efficiently with Grape's clean, intuitive interface. Your site visitors will appreciate Grape's streamlined, mobile-friendly presentation of your inventory. Before purchasing Grape please make sure you have read and understand our Refund Policy, as well as the Grape License Agreement. Grape has a very straightforward set of system requirements available from most hosting providers. Your hosting provider will be able to tell you if your server meets Grape's system requirements. Located just south of Pittsburgh, PA and established in 2009, Rasbora Media's primary focus is the development of proprietary applications for online auto dealer inventory management and employee recruitment. 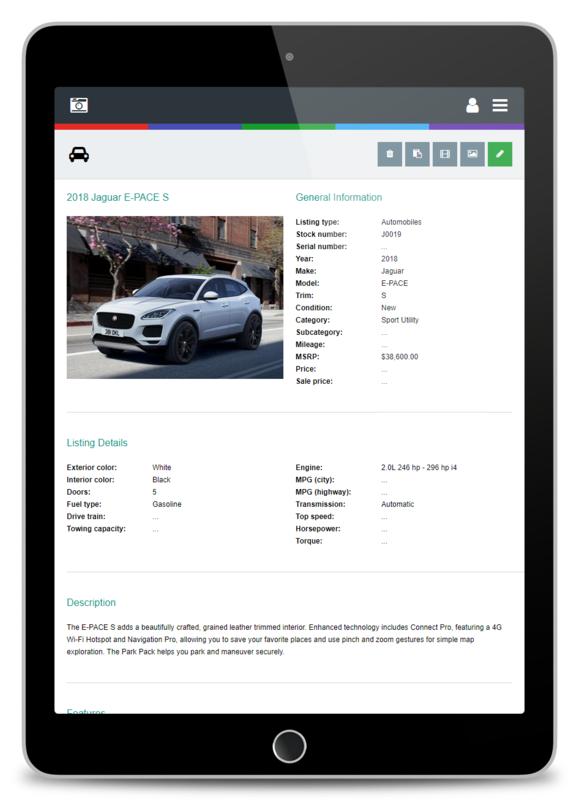 In an effort to streamline the deployment of our online auto dealer inventory managers across multiple websites we developed Grape, our auto dealer inventory management script for PHP. Grape has been in use on a number of websites for the past several years. In 2017 we made the decision to offer Grape to the world. We recognize that the key factor in the success of our products and services lies with our customers, their feedback has, and will continue to shape our products and services to better serve them, their employees, and their customers. We specialize in custom, mobile-first, web app and extranet development utilizing PHP and MySQL. Whether you need to modifications made to your installation of Grape, or need a little assistance integrating Grape into an existing website, or if you just need some PHP development work done, we'd love to help. We offer competitive rates and a quick turn-around. Use the contact form to the leftbelow and tell us about your next project. Please use the contact form below to submit your questions or comments. Our company owns multiple auto classified sites and we've tried just about every classified script on the market. Most of them are clunky and/or slow, or they lack the necessary support needed to really be able to function like advertised. We've been using Rasbora Media's scripts on and off since 2006 and in our opinion they're by far the best and always our 'go to' script when starting a new classified site. Their customer support is second to none and they've always been lighting fast in helping us get our questions answered and problems solved. We've also had them do custom PHP development for us which we've been just as satisfied with. Don't look any further, Rasbora Media's scripts are exactly what you've been looking for!